The Junior League of Dallas (JLD) and Mary Kay Inc., two of Dallas’ most philanthropic organizations, are proud to announce the four female recipients who will receive a combined $25,000 in collegiate scholarships through a new JLD program, Women LEAD (Learn • Excel • Achieve • Dream). 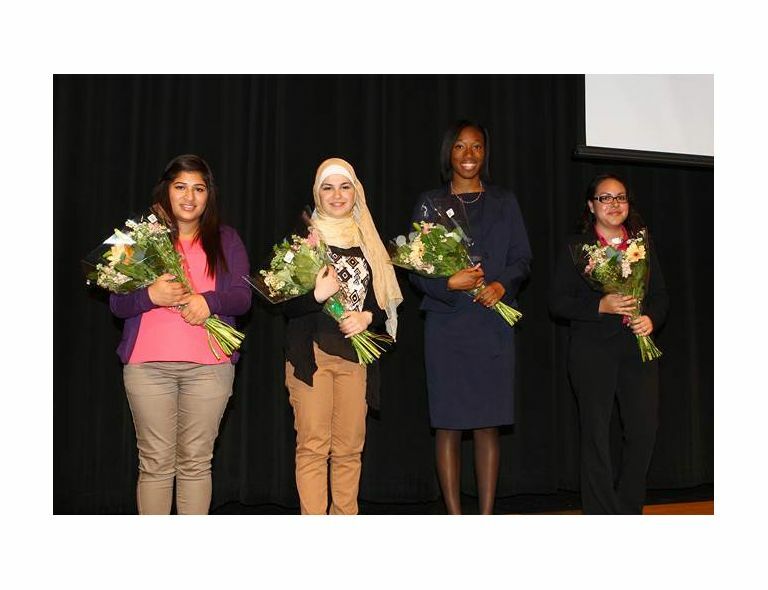 The inaugural event was held on March 27, 2014 at Emmett J. Conrad High School, where eight female Conrad High School senior finalists competed in an oratory competition followed by an awards ceremony. Fourth Place Winner Maria Monjaras, Third Place Winner Sumayah Al Haddad, Second Place Winner Lauren Jackson and First Place Winner Deyanira Zapata-Martinez. 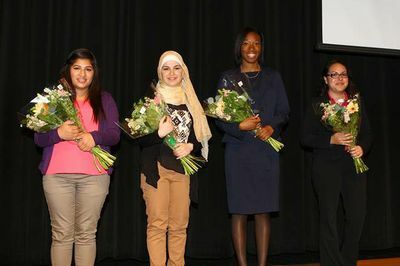 The Junior League of Dallas (JLD) and Mary Kay Inc., two of Dallas’ most philanthropic organizations, are proud to announce the four female recipients who will receive a combined $25,000 in collegiate scholarships through a new JLD program, Women LEAD (Learn • Excel • Achieve • Dream). 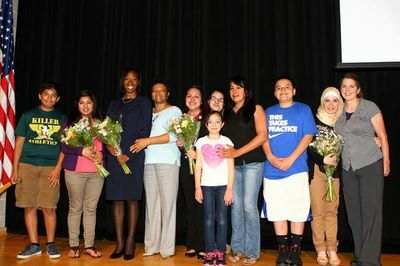 The inaugural event was held on March 27, 2014 at Emmett J. Conrad High School, where eight female Conrad High School senior finalists competed in an oratory competition followed by an awards ceremony. Director of Corporate Communications and Corporate Social Responsibility of Mary Kay Crayton Webb, Fourth Place Winner Maria Monjaras, First Place Winner Deyanira Zapata-Martinez, Third Place Winner Sumayah Al Haddad, Second Place Winner Lauren Jackson, Shannon Powell Hart of WFAA-Good Morning Texas, and Junior League of Dallas President Laura Johnson. DALLAS – March 28, 2014 — The Junior League of Dallas (JLD) and Mary Kay Inc., two of Dallas’ most philanthropic organizations, are proud to announce the four female recipients who will receive a combined $25,000 in collegiate scholarships through a new JLD program, Women LEAD (Learn • Excel • Achieve • Dream). 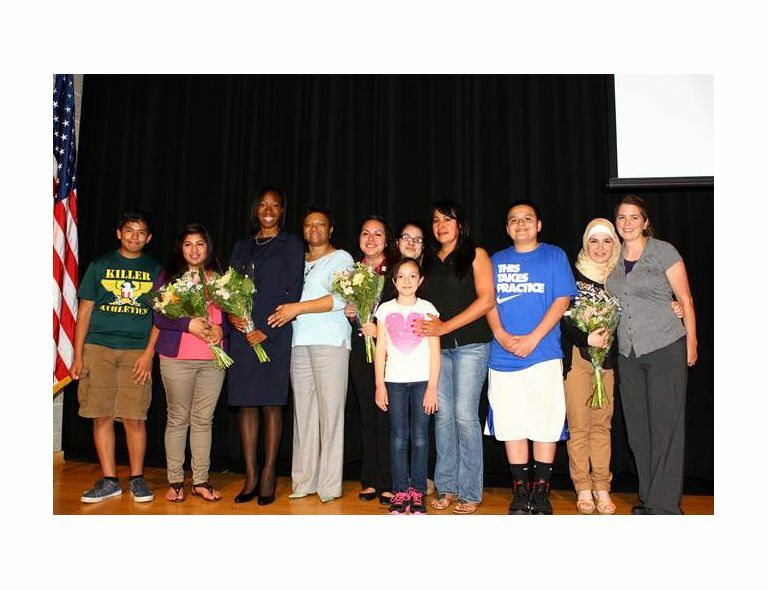 The inaugural event was held on March 27, 2014 at Emmett J. Conrad High School, where eight female Conrad High School senior finalists competed in an oratory competition followed by an awards ceremony. Each student prepared a three to five minute speech based on the essay topic, “How My Female Role Model Overcame Obstacles to Achieve Her Goals and How It Inspires Me.” Following the presentations, the judging panel determined the winners and awarded a total of $25,000 in college scholarship funds to four students based on the merits of their scholarship application and speech presentation. The first place winner, Deyanira Zapata-Martinez, will receive a one-time $10,000 scholarship. 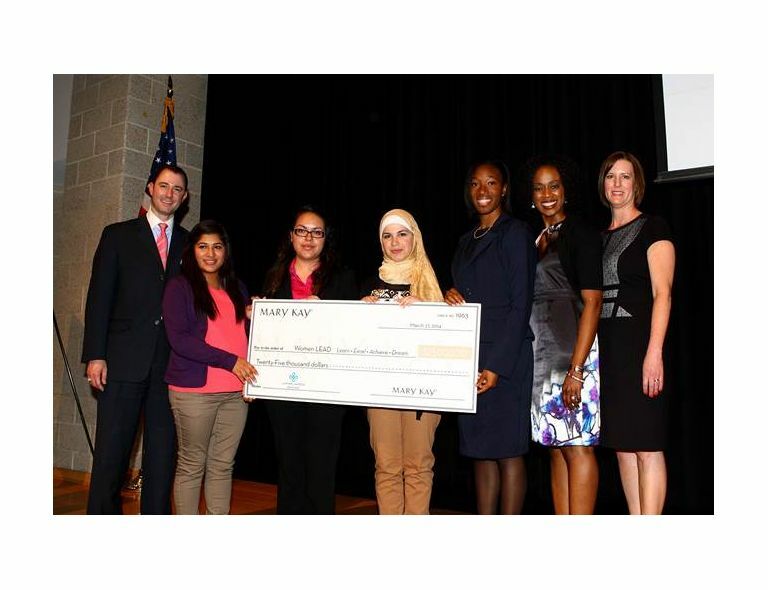 Second place winner Lauren Jackson, third place winner Sumayah Al Haddad and fourth place winner Maria Monjaras, will each receive a one-time $5,000 scholarship. These funds will be paid directly to the college or university the recipient attends. Deyanira Zapata-Martinez is deciding between the University of Texas and Texas A&M to continue her education. With a passion for math and science, she plans to major in electrical engineering and neuroscience. Second place winner Lauren Jackson plans to attend Louisiana State University and major in nursing. It is her way of helping people and staying directly involved in the community. Sumayah Al Haddad will attend community college before enrolling in the University of Arlington. She has decided to pursue a career in bio-medical engineering, as she always dreamed of being in the medical field. Last, but not least, Maria Monjaras is deciding between the University of Arlington and the University of Dallas and will pursue a degree in business administration. She aspires to be a successful entrepreneur. 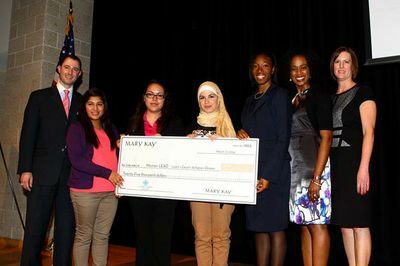 Founded in 2013 by the Junior League of Dallas in collaboration with Mary Kay, Inc., the Women LEAD (Learn • Excel • Achieve • Dream) Scholarship Program was created to assist female high school students in pursuing their dreams of higher education and to create opportunities for future women leaders. It is inspired by Mary Kay Ash – founder of the now iconic and global cosmetics company that she started in Dallas 50 years ago with just $5,000 and a dream of enriching women’s lives. Through a combination of application, essay and oratory competitions, entrants were evaluated on their interpretation of the entrepreneur’s founding principles in their essay response, academic record and community involvement. Irresistible products. Positive community impact. Rewarding opportunity. For 50 years, Mary Kay has offered it all. With 3 million Mary Kay Independent Beauty Consultants and $3.5 billion in global annual wholesale sales, Mary Kay is a top beauty brand and direct seller in more than 35 markets around the world. Discover what you love by connecting with a Mary Kay Independent Beauty Consultant in your area atmarykay.com. The Junior League of Dallas (JLD) is an organization of women committed to promoting voluntarism, developing the potential of women and improving the community through the effective action and leadership of trained volunteers. Since 1922, JLD has been building a better Dallas by training our members to be leaders and by providing valuable volunteer service hours and critical funding to area nonprofits. Now more than 5,000 women strong, JLD provides over 130,000 hours of trained volunteer service and donates more than $1 million to the community each year. For more information, please visit www.jld.net.